Viking Books for Young Readers, 9780670785476, 496pp. New York Times bestseller Alison Goodman's eagerly awaited new novel -- a Regency adventure starring a stylish and intrepid demon-hunter! Helen must make a choice: Save her reputation, or save the world. London, 1812. Eighteen-year-old Lady Helen Wrexhall is on the eve of her debut presentation at the royal court of George III. Her life should revolve around gowns, dancing, and securing a suitable marriage. Instead, when one of her family’s maids disappears, she is drawn into the shadows of Regency London. There, she meets Lord Carlston, one of the few able to stop the perpetrators: a cabal of demons that has infiltrated all levels of society. Carlston is not a man she should be anywhere near, especially with the taint of scandal that surrounds him. Yet he offers her help and the possibility of finally discovering the truth about the mysterious deaths of her parents. Soon the two of them are investigating a terrifying conspiracy that threatens to plunge the newly Enlightened world back into darkness. But can Helen trust a man whose own life is built on lies? And does she have the strength to face the dangers of this hidden world and her family’s legacy? 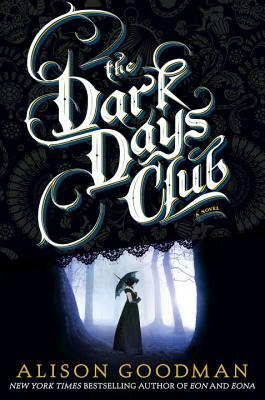 Set in the glittering social world of the Regency upper-crust, the Dark Days Club is a supernatural adventure that introduces New York Times best-selling author Alison Goodman’s Lady Helen Wrexhall—another heroine whom, like Eona, readers can take to their hearts. Alison Goodman is the author of the international best-selling and award-winning Eon/Eona duology, as well as the acclaimed Singing the Dogstar Blues and the adult thriller A New Kind of Death. Alison lives in Melbourne, Australia, with her husband, Ron, and their Machiavellian Jack Russell Terrier, Xander. She is working on Lady Helen’s next adventure. Visit her website at www.alisongoodman.com.au.